The first set involved Arthurs improvising over extremely bare electronic textures created on the spot by Simon Vincent. Apart for a very few sudden outbursts, most of which Arthurs’s, the pair’s set remained for the most part extremely introspective, Arthurs only occasionally drifting into the more musical end of the scope, favouring instead barely audible noises and textures, discreet blows or clicks and friction sounds of his instrument’s valves, as Vincent layered abstracts electronics, his part occasionally appearing to rework some sections of Arthurs’s performance, albeit in extremely processed and distorted form. After over twenty minutes of such minimal treatment, Vincent opened a slightly richer path, which for a moment swelled to incorporate richer tones before returning to a much more basic bubbling state, whilst the trumpeter’s contribution was once again reduced to just a few discreet blows. This first performance relied on very subtle noises, which found echo in Vincent’s decaying textures, but at times felt too introspective to work fully, especially as the pair seemed to get so lost into their work at the end of the second section of the performance that they didn’t quite seem to know whether it had reached its natural conclusion, leaving the audience somewhat perplex. The premise of Long Division is altogether more complex and visionary. Originally devised for the North Sea Jazz Festival as a four part improvised piece for trumpet (Arthurs), clarinet (Lothar Ohlmeier) and electronics (Icarus’s Ollie Bown and Sam Britton, in his Isambard Khroustaliov guise), the piece, receiving its UK premier this evening is set to be performed live by Arthurs and Ohlmeier, on a backdrop of electronics generated by computer programs created especially by Bown and Britton to react to the live performance, therefore making each instance of the piece totally unique. Whilst both Bown and Britton were present in the auditorium this evening they were simple witnesses of their own contribution. There wasn’t even any representation of their work, by way of computers, on stage. By nature more vivid than the previous set, Long Division is a strangely organic and fascinating piece which expands on the notion of improvised music by adding an additional unknown to the equation. Like the two performances documented in the quartet’s recent album, the evening involved various ‘collaborations’ between the four, in duo or trio form, with the two live performers also duetting on bass clarinet and trumpet, with no computer assistance. Beside the pair’s clear enjoyment of playing an entirely acoustic and improvised piece, this also served to draw parallels between the way the two improvised with each other and the way the software developed by both Bown and Britton reacted to their respective improvised sections during the rest of the set. If machines lack the inane human flair for tangents and randomness, they surely can be programmed to imitate and extrapolate, and randomness is also, in its mathematical form, a machine-like feature which is largely exploited on such project. 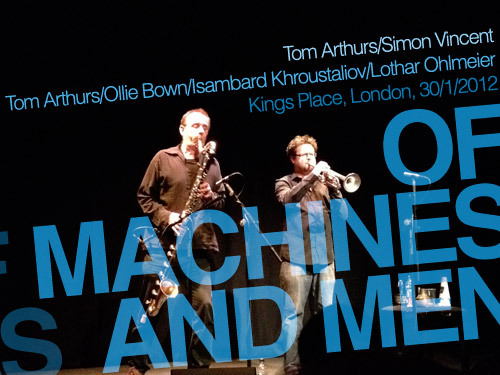 This interesting relationship between machines and real musicians worked very well this evening, first with Ohlmeier performing with the program developed by Bown, then Arthurs taking on Britton’s. For most of the set, it very much felt as if there was some element of dialogue between the two musicians on stage and the soundscapes which developed in the ether. But, whilst the software were initially developed to react to the music played on stage, it at one time felt as if, instead of reacting to an event, the machines were deliberately triggering a reaction from the stage when a sudden burst of bird tweets derailed Arthurs’s miniature noise harvest and plunged it into a more bird-like sequence. The two pieces represented very different aspects of improvised acoustic/electronic music. Whilst the Arthurs/Vincent collaboration was at times too introspective, there wasn’t any doubt that the two worked together as they proceeded towards forever more disintegrating structures. Long Division’s virtual aspect, confronted with its actual entity, made it paradoxically more concrete, and the absence of the computers’ physical representation was soon overshadowed by the interaction between the two musicians and the soundscapes they helped generating. First of all thanks for taking the time to listen to and comment on our music. I thought it might be worth adding that none of Tom’s sounds were processed by me. All my electronic sounds are indeed generated on the spot but from my software/hardware synths. (I’ve tried the “live-processing” approach, but found it didn’t achieve the flexibility that I at least am looking for… others of course do achieve it, as Sam and Ollie’s work proves, to a stunning degree). Thank you for your comment and for the correction. I must admit that it felt for the most part that you and Tom were playing truly individual parts, but there was one moment especially where I thought I could hear what Tom had just played but submitted to some heavy processing. It was clearly the result of the symbiosis between your two parts. I sometimes find it difficult to fully understand exactly which part electronics play in this kind of set up, so I am grateful you took the time to set the record straight.